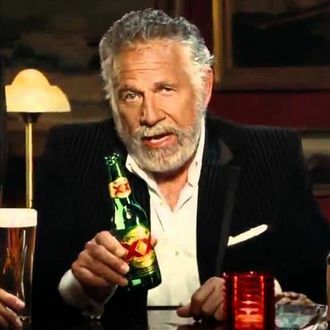 A fake beer spokesperson known as “the Most Interesting Man in the World” was just named grand marshal for this year’s 42nd annual Greenwich Village Halloween parade. That’s right, the spokesperson for Dos Equis Lager Especial will lead hundreds of puppets, dancers, musicians, and costumed New Yorkers along Sixth Avenue. Why? Because he’s the most interesting man in the world, of course! The parade has been in existence since 1975, created by puppeteer and mask-maker Ralph Lee. Initially, it was just a short neighborhood walk for Lee’s kids and a few others, but after two years, it became a citywide hit. While once scrappy, it’s now attended by more than 2 million spectators every year. But it’s also expensive to operate: In 2012, it struggled with financial problems after canceling due to Hurricane Sandy, and they were forced to use a Kickstarter campaign to keep the Day of the Dead alive for 2013. Though the parade doesn’t always have a grand marshal, in the past it’s been hosted by Gene Simmons, Kelly Ripa, and Whoopi Goldberg. They’ve also invited a young boy whose family was displaced by Hurricane Katrina, and they welcomed Carnival artist Didier Civil from Haiti to lead in 2010. They even asked Audrey, the giant flytrap puppet from Little Shop of Horrors, to host back in 2003. But this year’s choice represents perhaps the strangest of all grand-marshal choices. Bronx-born actor Jonathan Goldsmith (that’s “the Most Interesting Man”’s real name) has been starring in Dos Equis advertisements since 2011 — but before his self-proclaimed “overnight success” he was an extra in a few television shows and later taught theater at Adelphi University in Garden City, Long Island, the Post reports. For much of his life he was living in the Sierra Mountains, living on a sailboat in the Marina del Rey. “We are thrilled to have Dos Equis involved to keep this great NYC tradition alive,” parade director Jeanne Fleming told DNAinfo. He “embodies exactly what this parade is about – mystery, intrigue, and of course, interesting,” Fleming told the Post. Everything needs a sponsor these days, but this does seem like a new frontier of product placement. It’s hard to reach those seen-it-all young consumers these days! So just how much is Dos Equis paying to turn the Greenwich Village Halloween parade into a branded revelry moment?